I am fascinated by how one single cell can have so many possibilities. 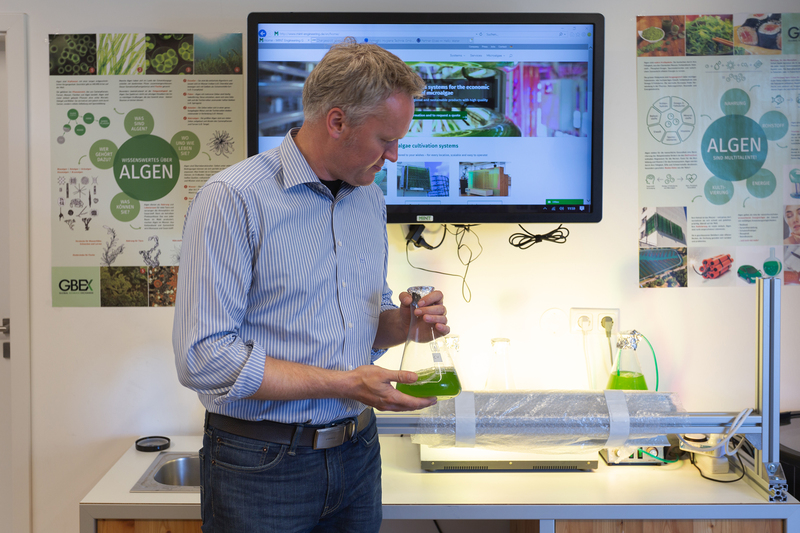 Innovator Interview: This is the story of how an algae bioreactor came to be. A what, you ask? Don’t worry, we had no idea what a bioreactor was either until we visited MINT Engineering, where the CEO, Gunnar Mühlstädt, told us all about his magical machine that could, maybe, one day feed the world. Gunnar Mühlstädt is standing in front of three lab flasks that hold neon-green juice. The flasks are on a moving platform that keeps the liquid moving in tiny whirls, like a science fair project. The flasks, Mühlstädt tells us, are just the prototype for the real algae bioreactor. Gunnar takes us outside on the balcony. On the facade of the MINT Engineering building, the sun hits bubbling tubes that glow like a green Holy Grail. This is not a scene from The Matrix. We are in Berlin, standing before the world’s first algae bioreactor built outside of a building and that is also approved to produce food, Mühlstädt tells us. Still, we don’t fully understand all the possible ramifications of the technology, but luckily he’s more than willing to answer all our questions. What does MINT Engineering do? MINT Engineering is a startup that designs machines that produce microalgae at a mass scale. I used to work in a huge Swiss corporation as a mechanical engineer, but I decided to leave my job and start MINT Engineering because I was so fascinated by microalgae. I was interested in the technical part of algae cultivation, so that is where I began my research. No one has much experience in algae. Maybe on the biological side they do, but not on the industrial side. Which is why at MINT Engineering we all had to go through a big learning curve. What made you so fascinated with microalgae? I am fascinated by how one single cell can have so many possibilities. Microalgae can be food, it can be in cosmetics – it can be everything you can imagine. What do you see as the potential for this one single cell for companies and for scientists? If you look at the food perspective, algae has a wide spectrum of proteins, lipids, and vitamins. But if you look at other industries, like the chemical industry, algae can be a substitute for raw oil-based materials. And companies like Haribo, for instance, are looking into algae as an organic pigment. Companies are now interested in the sustainability of their raw materials. We are not looking for people who want a spoon of algae in their smoothies. We are looking at an industrial scale. If there were a dream company that would buy this bioreactor, who would it be? And what would that company use the algae for? The dream would be if a company like Coca-Cola used algae products. They have a huge brand. Everyone knows them. If they would change mindset and say, “OK, in the future we will do healthy, sustainable and organic products,” that would be the dream. I would love to see such a big company move toward the future, and then everybody else follow with the next steps in food. And how could they use it, exactly? To make plastic bottles? Yes. Or as a color pigment. As a sugar replacement, it seems not possible, but as a bio-based plastic, it is. Why not in a few years? I also heard that some companies are buying bioreactors to reduce their carbon footprint emissions. Can you tell me more about that? A few companies are thinking about it. We are talking to them, but ultimately we have to avoid greenwashing. An energy company, like a coal company, will put a small algae bioreactor in front of their facility and then say: “We are a green company.” I don’t like that. They exude millions of tons of carbon dioxide, and a little bit of algae will not offset a fraction of that pollution. You would need a huge algae bioreactor to do that. It is a first and important step to think about but we need to stay realistic. What have been the biggest challenges in producing microalgae? Do you think there is enough demand, and if not, how is that changing? At first, the biggest challenge was the technical aspect of building the bioreactor, but now the system is under control and ready. Now, the most critical step is finding the right partners in the market. We are not looking for people who want a spoon of algae in their smoothies. We are looking at an industrial scale. We need industrial partners. We need to fit the demands of huge companies like Haribo or, maybe in the future someone like Coca-Cola. For companies that go into product development, they first need to see that the raw materials are ready. Now that the equipment is here, the market also needs to be ready to explore algae. What kind of algae is in the bioreactor right now? Do you see potential for another species of microalgae? Yes, there are many interesting kinds. But it is a hard process to get approval. I think the committee will approve more in the future. It doesn’t make sense to avoid 500,000 other microalgae species. I hope that, in the future, we can start to feed the world with algae. We believe algae is part of our future. That is why we are doing this. Want to meet Gunnar and the MINT Engineering team? We have two events coming up: the Ocean Cocktails algae drinks and snacks night on June 13th. And then, about two weeks later, we have an entire algae-themed dinner, Future of Food: The Age of Algae,with the MINT Engineering team on June 28th. Tickets are going fast so get your spot soon! 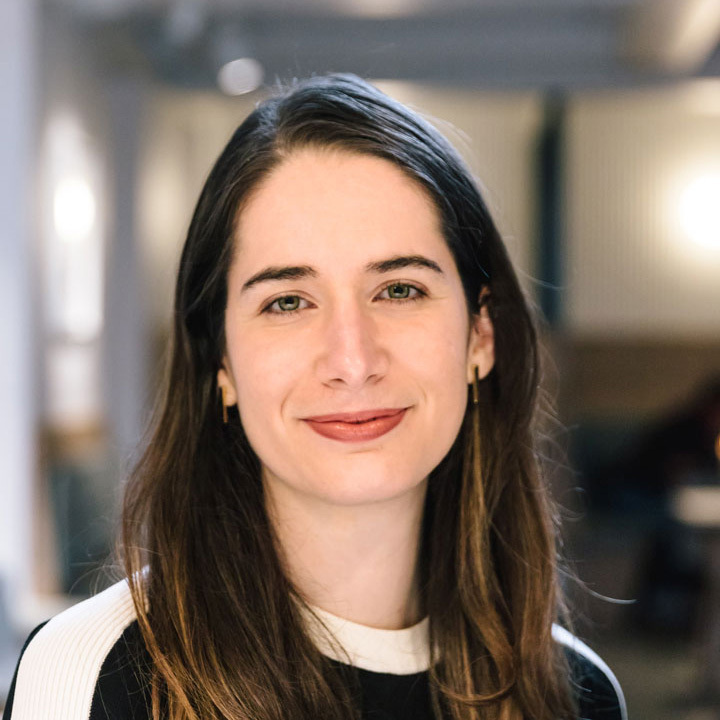 Tamara Masri is a writer and researcher based in Berlin. Before HERMANN'S, she worked as butterfly gardener and truck farmer.